An independent survey of 2,000 UK families, commissioned by toy company Little Tikes, reveals that parents are fed up with the lack of quality time spent together, with the average mum and dad experiencing seven pangs of guilt a week! Being too busy or tired to give kids their full attention and working long hours have been named amongst the top guilt triggers. 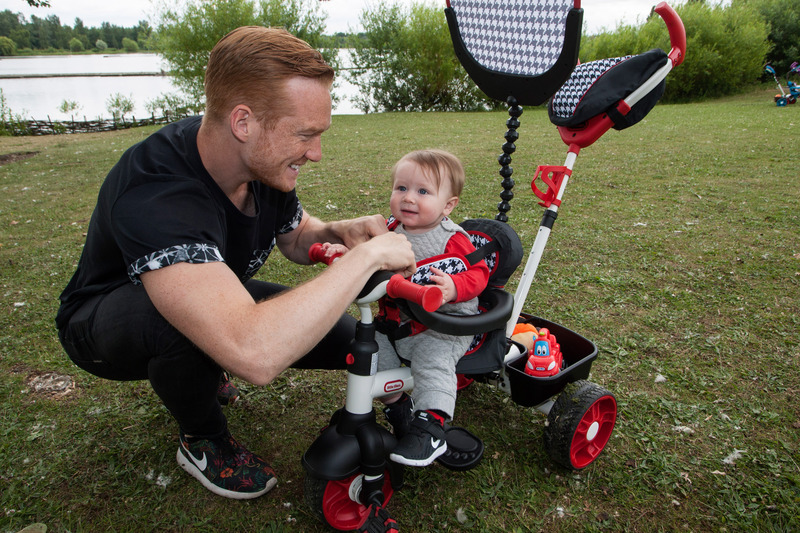 Little Tikes has linked with Olympic Gold Medallist Greg Rutherford to encourage families to ditch the guilt and enjoy the great outdoors this summer with their ‘Little Trikers’ campaign. They’re giving 50 4-in-1 Sports Edition Trikes away to inspire families to join in the sun this summer. Log on now to www.littletikes.co.uk. The survey reveals that UK parents are regularly left feeling guilty that they don’t go on more family days out, rely on the television to occupy kids while they get the chores done and don’t have more patience when dealing with their families. 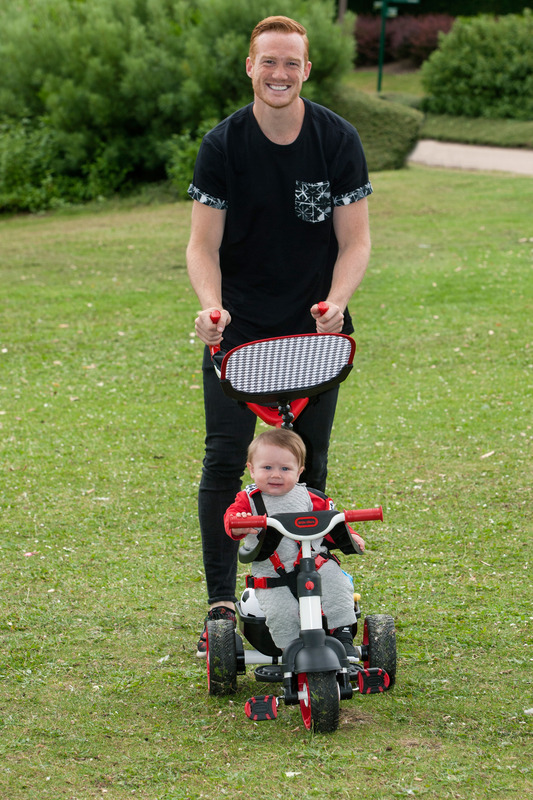 On a mission to get everyone out and about, having fun and discovering new places, Little Tikes’ ‘Little Trikers’ campaign has teamed up with gold medal Olympian Greg Rutherford and his family to encourage families to make the most of the sunshine and go for a walk, release some happy hormones endorphins and feel fit, strong and inspired at the same time. Greg, along with his partner Susie, is all set for a summer of fun with their son Milo in his 4-in-1 Trike Sports Edition, as he turns nine months old this month. So everyone can share the adventure, Little Tikes is giving UK families the chance to win one of 50 4-in-1 Sports Edition Trikes. All they have to do is say what type of Triker their little one will be at www.littletikes.co.uk/trikers-with-greg. All entrants who have five likes or more will be entered into a free prize draw to win one of 49 4-in-1 Sport Edition Trikes, with one overall winner chosen at random to win one 4-in-1 Trike Sports Edition and £1,000 worth of toys, for even more family fun. Families can also add their best Triking routes to Little Tikes’ Top Triker Trails. Follow #toptrikertrails so as not to miss out! 1. Go as a family – You can walk and talk at the same time and enjoy exercising and spending time together. This is a great idea for meeting up with other family members as well as friends. 2. Watch your steps – It’s recommended you walk 10,000 steps every day. Use an app or a pedometer to measure how many steps you do. Going out with your child in a Trike, you will probably find you are surprised by just how many steps you’ve taken! 3. Look up – It may sound obvious but it’s important to take stock of your surroundings, feel inspired the nature all around you. 4. Walk tall – Walking is a great gentle exercise and if you walk tall and pull your tummy you can help improve your posture too. 5. Change it up – Don’t do the same route all the time, you will lose motivation and give up. Go to the park, walk around the block or in town. Check out walks from other parents on the Little Tikes’ interactive map and on Twitter and Instagram with #toptriketrails. The sporty and cool styling of Little Tikes’ 4-in-1 Sports Edition Trike is suitable from age 9+ months and is perfectly suited to any budding sports stars. Great for babies and beginner riders, these funky pink, blue and red trikes are designed to grow as a child’s skills develop. The 4-in1 use allows it to grow with a child through four separate learning stages; Guided (9+ months) – where parents can push and control. Infant foot rest is down and safety harness in place, so child is unable to turn the wheel and enjoy the feeling of being on the move; Learning (12+ months) where the infant foot rest is up and the safety harness is in place. The child is unable to turn the wheel, but can learn to pedal, strengthening legs and learning about speed control; Developing (18+months) where it is both child and parent powered. The waist bar is removed so the child can pedal and turn the wheel, whilst parent also has steering control – to help avoid any veering of course as little one learns. ; and finally Independent (30+ months) where the child full control as the guided handle is removed – allowing them the chance to travel and discover at their will. Key features include a detachable, easy grip handle for parent control, 5-point seat belt harness and safety bar, padded, soft seating, removable shade canopy, durable quiet-ride tyres, convenient beverage holder, packing bag for additional trike storage. To find out more from Greg, checkout the interactive map of #toptrikertrails and be in with a chance to win a Trike visit www.littletikes.co.uk/trikers-with-greg.